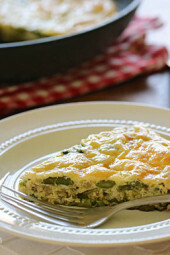 Spring asparagus, shallots and Swiss cheese is a delicious combination with eggs in this slimmed down frittata which is perfect for breakfast, lunch or dinner! Frittatas are the perfect brunch necessity. 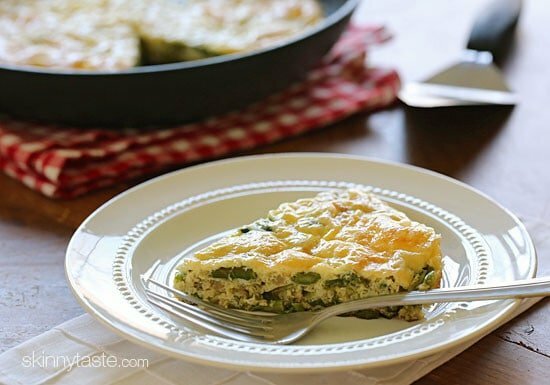 Some of my favorites are Tomato and Zucchini Frittata, Spinach and Feta Frittata or Turkey and Sweet Potato Frittata. This is really filling, and the leftovers for perfect for lunch or breakfast the next day. 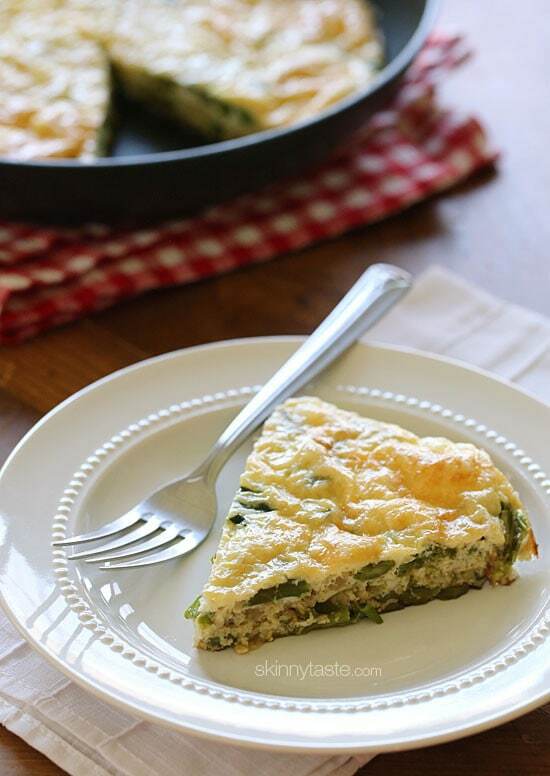 Fritattas are also great if you’re watching your carbs, and they are so inexpensive to make. I love having a Fritatta for Meatless Mondays with salad on the side. 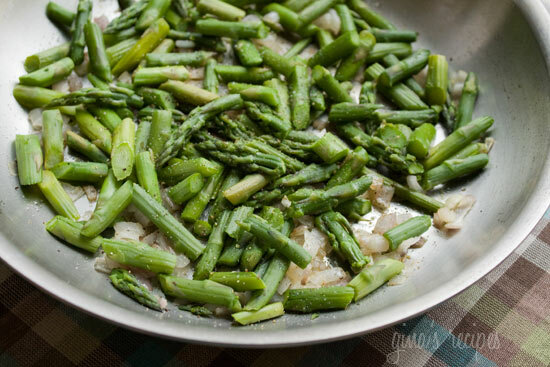 Whenever asparagus is in season, I buy it and steam it right away to use for quick recipes throughout the week. 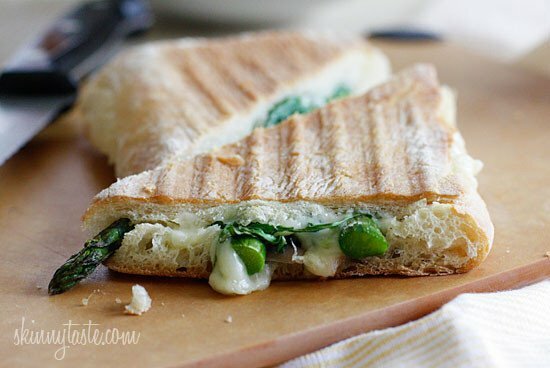 It’s great to add to eggs, salads, served chilled with a simple Dijon Vinaigrette or even to add to paninis (LOVE this asparagus prosciutto panini)! Asparagus is loaded with nutrients, it’s a great source of fiber, vitamin A and C, and it’s packed with antioxidants, which makes it a super star in my book! Steam asparagus crisp and tender, about 3 to 4 minutes. Thinly slice on the diagonal into 1/2-inch pieces. Heat butter in a 10-inch oven safe skillet over medium heat. Stir in shallots and saute until golden, about 4-5 minutes. Add steamed asparagus, salt and pepper. In a medium bowl whisk eggs, egg whites, grated cheese, milk, salt, and pepper. Add the swiss cheese and mix well. Add eggs to the skillet making sure eggs cover the asparagus. Cook on medium for about 4 minutes, until the edges begin to set. Move the skillet to oven. 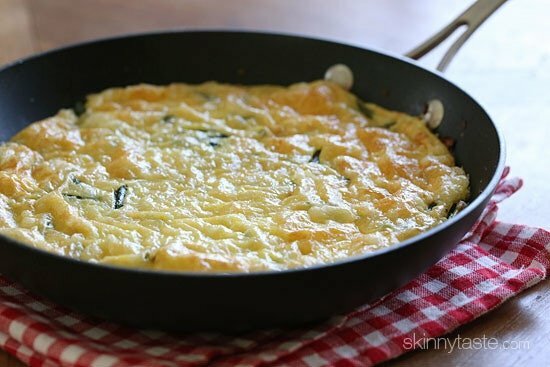 Cook about 16 to 18 minutes, or until frittata is completely cooked. Serve hot, cut into 4 to 6 equal wedges.